The top nuclear envoys of South Korea and Russia discussed ways to enhance cooperation on denuclearization and peace on the Korean Peninsula, in Seoul on Tuesday. “I am pleased about close communication between South Korea and Russia at a very critical moment for complete denuclearization and permanent establishment of peace,” Lee Do-hoon, South Korea’s special representative for Korean Peninsula peace and security affairs, said ahead of the meeting. Lee added that momentum for dialogue involving the Koreas, the US and Russia is a result of joint diplomatic efforts. A flurry of diplomacy this year brought together the US and North Korea for a historic summit in Singapore, and led to three inter-Korean summits. 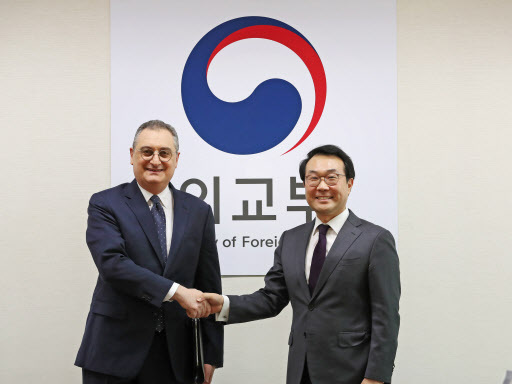 Russian Deputy Foreign Minister Igor Morgulov welcomed an improvement in inter-Korean relations, North Korea-US relations and easing of military tensions on the Korean Peninsula. “What I would like to note, in particular, is that such a situation was created by the road map jointly suggested by Russia and China,” he said, referring to a step-by-step, reciprocal approach toward North Korea’s denuclearization. The US has demanded North Korea completely denuclearize first before any benefits -- such as sanctions relief -- are given to the communist state. “I am glad about the real achievement of deepening inter-Korean economic cooperation. An improvement in inter-Korean relations is laying the groundwork for the stability on the Korean Peninsula and in Northeast Asia,” he said. Russia has been one of North Korea’s closest allies amid toughening US-led international sanctions against the reclusive country. Russia and China have openly called for the relaxation of these sanctions in return for denuclearization steps the North has already taken. High on the agenda were expected to be a deadlock in stalled denuclearization talks between the US and North Korea as well as North Korean leader Kim Jong-un’s possible visit to Russia next year.